Please mail your completed 2014 Virginia Division Renewal Statement to the address listed on the left lower corner of the form. If you did not receive a statement please contact me. Make checks payable to the Edmund Ruffin Fire Eaters Camp 3000. Dues are payable for August 1st forward. There is a three month grace period. After October 31st, the member must pay a $5 additional reinstatement fee to VA Division and National. If you have any questions please contact Fred Merridew. Ready for the news?? Our camp newsletter is now available. Seven Fire Eaters gathered this morning to take on our adopted stretch of highway. 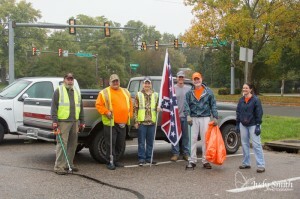 Thanks to all those that came out to start off our care of this segment of Cold Harbor Road.